When you look up into the night sky, you can spot thousands of stars from a dark location on a given night. But those stars only appear as pinpricks of light to the human eye; unfortunately, they look much the same to advanced telescopes as well. While nebulae and clusters can span hundreds of light-years, a single star alone is quite small. In the past, this left astronomers with but one star whose surface could be studied in any real detail: the Sun. But now, a team of astronomers has combined three telescopes to map the surface of another star: the red supergiant Antares. Their work, published August 16 in Nature, utilizes the European Southern Observatory’s Very Large Telescope Interferometer (VLTI) in Chile to create the best yet image of the surface of a star that is not our Sun. The data was taken in near-infrared light with the VLTI’s AMBER instrument to achieve a resolution seven times smaller than the star’s angular diameter and almost 12 times smaller than its full atmospheric extension. As a result, the team was able to measure the speed of gas moving across the face of the star, a feat that has only ever been achieved for our Sun before now. The results show that Antares’ atmosphere contains several clumps of gas and extends farther from the star than expected, nearly two times the star’s radius. Convection alone, which is the rising of heated gas and the sinking of cooled gas, does not explain the extension of the atmosphere to such great distances. This suggests a different, as-yet-unexplained process at work in the massive star’s atmosphere. The astronomers also determined that mass loss experienced by supergiant stars, which often shed several solar masses’ worth of material before they explode, is occurring farther from the star than 1.7 stellar radii. When a star goes supernova, that lost mass lights up as the shock wave from the explosion tears through it, leaving behind the stunning supernova remnants we see. 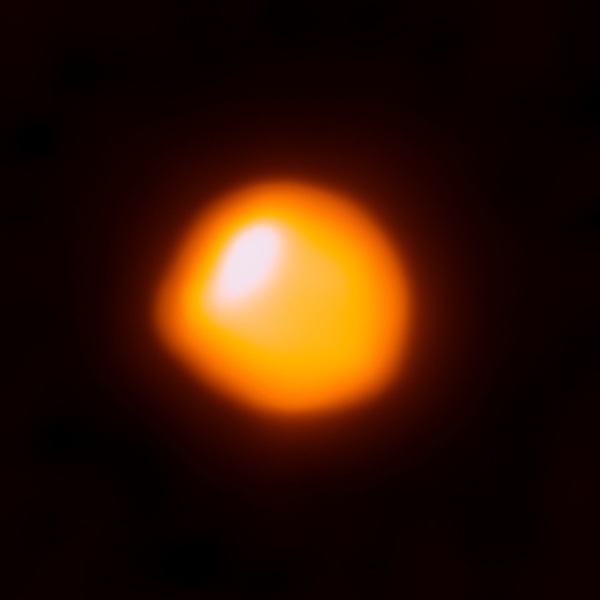 Similar activity has been seen in the atmosphere of the supergiant star Betelgeuse in the constellation Orion, but Antares’ atmosphere appears even more turbulent. Betelgeuse was imaged using the Atacama Large Millimeter/submillimeter Array earlier this year.Antares is a red supergiant star located about 550 light-years away with a mass of about 12 times that of our Sun. It will someday explode as a type II supernova, and represents a “prototypical” star of this type. It is often called the “heart” of the constellation Scorpius, and is visibly red to the naked eye when spotted in the sky. In fact, the name Antaresitself essentially means rival of Ares (or rival of Mars) because the star is easily mistaken for the planet Mars.